Homemade wall mounting for a small air compressor. Incorporates a hose reel to improve overall usability. 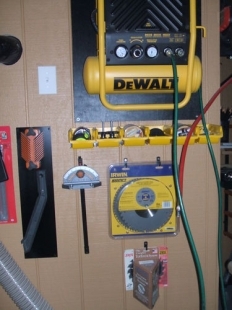 That DeWALT compressor will burn up if operated while hanging like shown. Read the owners manual, it must be sitting flat. GREAT space saving idea. I really like the creativity of this one.